House of Doolittle Reversible Wall Planner - 32" x 48"
Block Size: 1.38" x 2"
Block Size: 1.63" x 1.63"
Media Size: 32" x 48"
Dated wall planner features a write on/wipe off surface on both sides. 12 months of planning range from January to December on both sides. One side displays 12 months in a horizontal format, and the other side displays 12 months in a vertical format. 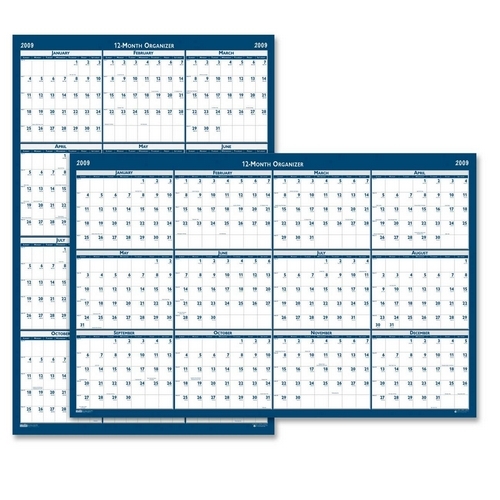 Each month has Julian dates, days remaining and unruled daily blocks to write reminders, deadlines and more on the heavy laminated surface. Wall planner includes a water-soluble marker and hanger. Planner is made of 50 percent post-consumer paper.